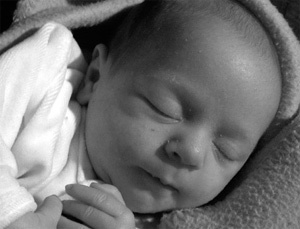 My newborn son, Connor, is truly a ‘miracle child’. 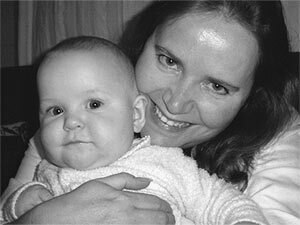 Going back to 1980, I thought then I might never become a mother because ‘out of the blue’ I was diagnosed with cervical cancer (CN3). Despite having annual PAP smears and only six weeks after a ‘normal’ smear test, I haemorrhaged at work. Within 24 hours I was informed I required surgery, the minimum being a cone biopsy, dilation and curette, involving the removal of the surface tissue of the cervix and scraping of the interior surface of the womb. Immediate pathology testing would determine if there was a more serious problem, then worst-case scenario, a hysterectomy would be required on-the-spot - otherwise I would be on drug treatment with six monthly checkups and pathology to ensure the cancer had not returned. I would not know until emerging from anesthesia which was the outcome. Fortunately, although the cancer had progressed rapidly from level 3 to 4, it was entirely excised from the cervix and a hysterectomy was not required. The future possibility of bearing children was dubious, as in such a case, scarring can limit conception or otherwise cause miscarriage. Sometimes with a stitch to the mouth of the womb, pregnancy may proceed to term by require delivery by Caesarean section. I had a lot of scarring. However, a the time my partner, Roger, and I were not planning to have children. Moving on to 1997, I severely injured my ankle in a dance accident and was told by my medical specialist that I would never dance again. As I worked as a teacher of theatrical performance, I was determined to prove him wrong but six months of conventional treatment provided little improvement. So with some skepticism I attended a rei-ki seminar on the recommendation of a respected friend. By the end of the three day seminar, the pain in my ankle had disappeared and less than one month later I won a leading role in a local production of “A Chorus Line” after a three hour dance audition! The really big surprise was advice from my doctor at my next gynaecological checkup that the cervical scar tissue had disappeared! Having a baby became possible. In 1999, when I became the area co-ordinator for the Usui Rei-ki Network in Canberra, my husband took rei-ki I and later rei-ki 2 with Keven Duff, and in 2002, after much soul searching, we ceased birth control and apart from giving myself rei-ki every day, I took sensible precautions to avoid toxins and very soon became pregnant. Approaching 40, I had almost no nausea, little excess weight gain, no swelling in my legs, no sleep problems nor back pain. In fact, I worked right up until two days before my labour commenced. Disappointingly the baby presented breech and a last minute Caesarean was performed, but with much absent healing support In absentia from rei-ki 2 graduates. The hospital staff commented on what a calm and loving atmosphere prevailed during this ‘emergency’ - Connor James arrived with his ankles around his ears on July 9, 2004, seven weeks before my 40th birthday and is delightfully calm, happy, healthy and beautiful and, thanks to rei-ki, his mature age parents have plenty of energy to deal with him. Many thanks also to all those rei-ki 2 helpers for their distant healing.